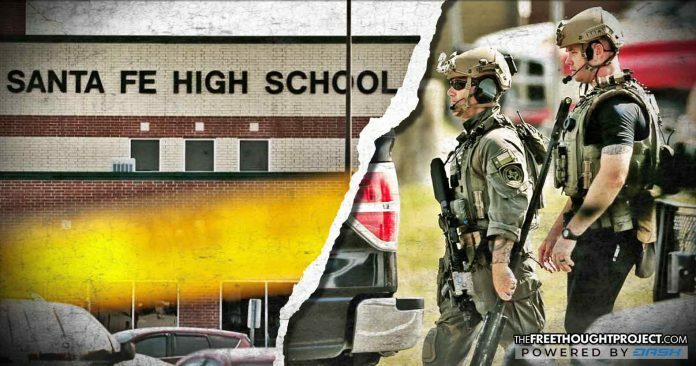 Santa Fe, TX — Last week, a 17-year-old high school student allegedly brought a .38 caliber handgun and a sawed off 12-gauge shotgun into Santa Fe High School and began shooting students and teachers. Now, as more details emerge, we are learning that some of the victims could’ve been killed by police. According to Galveston County Sheriff Henry Trochesset the gunfire in the school lasted a half an hour. During that time, police were engaged in a shootout with the gunman for 25 minutes, according to authorities. When the gunfire finally ceased, the gunman was alive while eight students and two teachers were killed. On Monday, Trochesset told CNN that officers arrived quickly and engaged the shooter in the school’s art lab section just four minutes from the time of the first shot. According to police, the suspect told investigators he acted alone and spared people he liked because he wanted his story told. Now, however, that story may a take turn and involve police officers. As the victims and their families try to imagine why a person would carry out such a horrific act, some insight is now emerging. One of the victims, 16-year-old Shana Fisher, had reportedly rejected the shooter’s advances for months. A week before the shooting, Fisher stood up in class and publicly proclaimed that she did not want to go out with him. Sadie Baze, Fisher’s mother said she believes that embarrassed the shooter so much that he targeted her. “One of the shotgun shells was for my daughter,” she said. Along with Fisher, the shooting also claimed the lives of students Jared Black, Sabika Sheikh, a Pakistani exchange student; Chris Stone; Angelique Ramirez; Christian Riley Garcia; Aaron Kyle McLeod; and Kimberly Vaughan. Teachers Glenda Ann Perkins and Cynthia Tisdale were also killed. Officer John Barnes who did the opposite of what police did in the Florida school shooting, was also shot as he engaged the shooter. He survived and is expected to make a recovery. As the details continue to unfold over this most recent tragedy, hopefully the public and the families of the victims will not be kept in the dark as they deserve to know the truth.